Work for Apple OS X Yosemite? Learning about OS X Yosemite? "I use this OS on my macbook"
I like the easy use of the OS, it makes my work more effective. Every new version is give a bit more options and features to the previous versions. This one improved the battery time and the overal stability. I like the splitview and the opntion to set the menubar to dark theme. I also like the continuity feature, what makes it possible to contineu a task on my iphone or ipad, like emails, texts, safari browsing. I don't like that some of the professional apps are not avaible. And sometimes they remove small features during an update, what was in the previous versions. I recommend this OS to everyone, who like apple products. I didn't find any disadvantage to update to this version from the previous one. I use it for my daily work at a design studio. I am using it for product design. I make drawing, 3d modelling, rendering, presentations, prints and all kind of design tasks. It is free, easy to use and have a amazing interface. The user interface is perfectly designed give you new fresh feeling of apple OS X. The new photos is also better than the old iphoto or the Aperture. Personally I think that the highlight is the interface. The layout is much more easier to master than the pervious OS it is really a grate enhancement to your macbook. Although I really think Apple OS X Yosemite is a great OS, there are some minor issue. First of all Yosemite have some performance problems on the initial release, I am not sure have it be resolved yet or not. This will make your mac lag sometime you have to reboot your mac to resolve the problem. Just upgrade it, it is the OS you want to help your career. After I changed into this OS my macbook is more productivity. As I can easily find I needed with the new user's interface. Before I upgrade it the search bar is not that user friendly I am having a hard time to find what I want. So after I upgraded it really boost my productivity and help me to really focus on my job instead of finding the software I want. "runs great on entry level Mac"
My laptop is late 2011, entry level and Yosemite runs great. It allows some of the continuity features and communicates well with my phone. Some features I can't go back from are the iCloud browser tabs and the messages, phone calls and alerts showing on both the computer and phone. This operating system runs great even though I haven't added more Ram or extra bells and whistles. Some features don't work on the older machines. While I get enough functionality out of it to make it worth while, some features such as Handoff don't work. Also the iCloud functions sometimes disconnect forcing a restart on both the computer and phone. Check your system requirements, back your computer up. I didn't have an issue with the upgrade but some of the older programs needed a re-download. Solved the problem of having to update or purchase a new computer. Benefits are answering messages directly using a real keyboard instead of typing emails or texts on a phone. "Convenience of iOS in a full blown OS X"
Yosemite runs faster on my older machines than any of my previous OS Xs, and it has added some features that help me from having to step away from my computer like being able to make and receive phone calls straight from my computer. Safari is faster and cleaner looking in Yosemite than it was in Mavericks, and it is a nice addition to my browser options alongside Google Chrome and Mozilla Firefox. Many of my work applications took some time to be compatible with OS X Yosemite, so I could not upgrade immediately and had to work to get some of my applications to function normally. Yosemite is old enough now, however, that this should not be a problem for people looking to upgrade. Absolutely upgrade to Yosemite if you are running an older OS. It will make a difference performance wise on your Mac, and it is incredibly easy to use if you are familiar with any previous OS X. Notification center, making and receiving phone calls, and other simple iOS elements built into my desktop keep me focused on my computer and away from my phone while I am at work. Spotlight seems to run faster for me than it did on Mavericks, so finding old documents and quickly accessing programs not on my dock speeds up my workflow. "Perfect synchronization across all Apple devices"
I like how it integrates with all other apple devices. I have an iphone, apple tv, and ipad and it works really well with all of them. I still am not able to send messages via text from my laptop to non apple phone users. As always, make sure that all your apple products are updated to the latest software available so that you don't experience any issues. Thanks to all of us using the same software we can share files easily and quickly. "Much imptoved after update to Yosemite"
I have a MacBook Pro Retina that I recently updated to Yosemite. After the update the computer seems to run much faster and more efficiently. In addition, I have noticed a small increase in battery life. In addition, I frequently use the Apple calendar and have noticed there are several more additions and improvements that make it more functional. I also love the additional function of Maps. The update took quite a long time to download. If you have used Apple OS before, it will be simple to get used to. My computer is much more efficient, both in terms of processing and battery power, which lets me get more done. I love the way the operating system is so intuitive and easy to use. It's a great jump up from OS X Mavericks and is a must need if you want a more stable computer that is efficient. I dislike that there is still no update to the Mac App Store. It really needs to be made into a better signature product for software distribution. Also, Siri would be a great feature to incorporate. But it now, if you have a Mac, it's a free upgrade. What's to lose? I'm becoming more efficient by the day. The keyboard shortcuts and thumb pad shortcuts make things so much quicker to do. I've realized that OS X is the most efficient system. The most obvious change, visually at least, is the new interface. Yosemite does to the Mac what iOS 7 did to the iPhone and iPad. Its user interface is flatter – though not flat, there are still drop shadows and other nods to the third dimension, it's just that now they exist for a purpose rather than being merely eye candy. No more glassy textures. Not a huge amount has changed here, but there is one key addition: iCloud Drive. Your iCloud storage drive now shows up in the Finder and you can drag and drop files and folders to it just like any other location. It also displays the files you've opted to store there from apps like Pages, Numbers, and Text Edit. Brand new in Yosemite is Dark Mode, which turns some aspects of the OS a much darker shade of grey, to make it more comfortable to use your Mac in dim lighting. These include the Finder menu bar, Dock, and application switcher. During the beta period some elements of Dark Mode, such as Finder menus, were poorly implemented, and it remains to be seen whether they have been fixed in time for the full release. The manipulation of my work go faster and more efficiently. Get OS X El Capitain, it's better. "The least slow operating system"
I do not like that you can not access things that does have El Capitan. Because it has helped me to work on a freelance basis and submit my design projects. "OS System for Mac Works Great"
I like the ease of use. The integration with apps on every platform. The connectivity to my iPhone. The quality of using other products. There is not really anything I dislike about this operating system. Having a working computer system makes running a business a lot easier. "Wouldn't use anything but a MAC"
OS X Yosemite is very user friendly and stable. Sometimes it can be a little slow to load. I can have all my business computers running the same platform. "Pretty OS update, but quickly moving away from its UNIX roots"
The UNIX foundation, moving to a flatter aesthetic. The new mandatory Photos program, things feel slower. Learning about Apple OS X Yosemite? * We monitor all Apple OS X Yosemite reviews to prevent fraudulent reviews and keep review quality high. We do not post reviews by company employees or direct competitors. Validated reviews require the user to submit a screenshot of the product containing their user ID, in order to verify a user is an actual user of the product. Hi there! 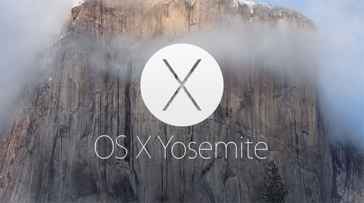 Are you looking to implement a solution like OS X Yosemite?